Top referee Claus Bo Larsen has hit out at Cristiano Ronaldo’s “theatrics”. The Danish ref, 45, who took charge of his final Champions League game on Wednesday (Milan vs Ajax), claims officials are more than aware of Ronaldo’s weasel ways. “He’s always out to get a cheap free-kick, especially at home,” Larsen told Ekstra Bladet. “We tended to talk before games about how he’d go down easily. Larsen also revealed he is on good terms with Manchester United gaffer Sir Alex Ferguson. 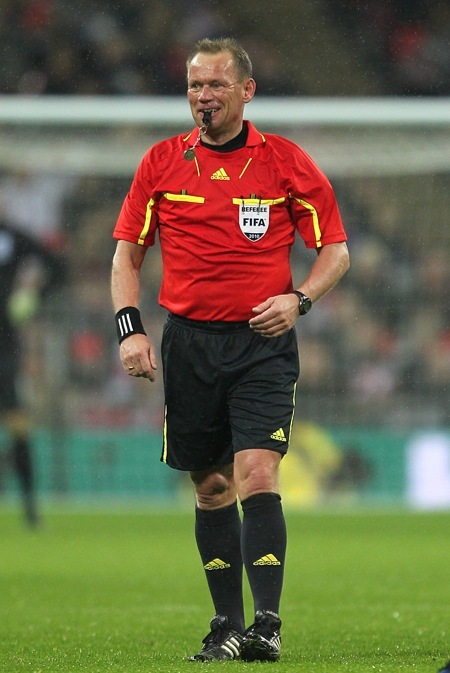 “I have a good relationship with Ferguson, even though he sputters and shouts and screams at referees,” he said. “I’ll never forget him coming to knock on my door after a Champions League game at Old Trafford. Fergie praising a referee? Now that is hard to believe. Fergie praising a ref? That’ll be the match where they got 9 penalties and 12 minutes of injury time. Ollie, way to feed into the ridiculous melodrama that is the english media. Referee “Blasts” Ronaldo? Sounds more like he just made a few remarks.